Nate Houge » why’s this bread all up in my grill? Humble Walk had it’s very first bake sale on Sunday. 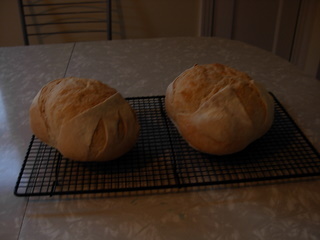 Four loaves of bread turned into $80. Not bad. Now the kids can go on an urban immersion retreat. Rock on. As one of the contributing bakers I had planned on bringing a loaf of sourdough but since sourdough takes a bit of time and can be a little unpredictable with how it uses that time I also made some simple sandwich bread and a garlic baguette. Those are the ones that made it to the bake sale. I stuck the sour dough in the fridge to slow it down for the night and returned to it on Monday. Step 2. Grill Steaks. 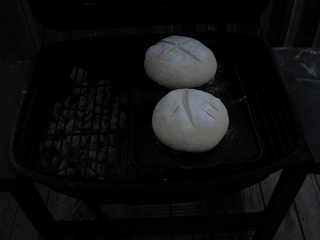 This step is optional, but why would you fire up the grill just to bake bread? Why’ll we’re at it, why would stand next to those fine slabs of beef at the end of a long day without a beverage in hand? Again, you don’t have to, but why wouldn’t you? 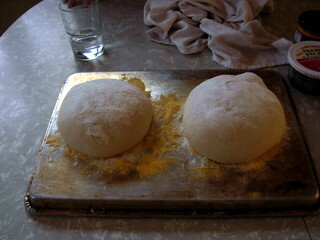 Oh and you’ll note there’s an iron griddle preheating on the top rack – that’s where the bread will be living in a bit. Step 3. 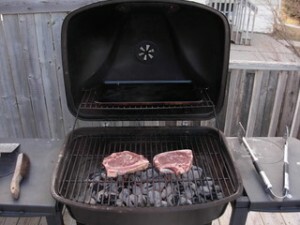 Set down your optional beverage and remove the steaks from the grill. At this point I slid the coals over to the left and placed my griddle on the main rack to the right. I thought this might give a more indirect heat and lower the risk of scorching the bottom of the bread. Step 4. Go eat your steak. Check back in a bit. I actually forgot this step. I meant to check it at 45 minutes but got distracted with some basement remodeling details. Luck for me an hour and 15 minutes worked just fine. Step 5. Cut it. Adorn it. Eat it. I think as spring progresses I’ll try this a few more times – it’s always nice to keep the head outside and I hate wasting all that heat after you’re done grilling. Go buy some steaks, go bake some bread. 23 March 2010 at 10:33 pm. Sourdough recipe, please. You know my starters don’t start. 24 March 2010 at 8:25 pm. 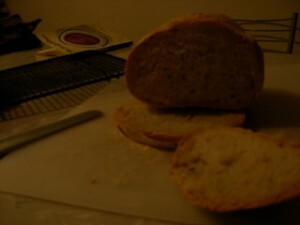 http://www.io.com/~sjohn/sour.htm but my current starter also had a 1/2 teaspoon of yeast in it – as a result it’s not that sour but I’ve baked 2 dozen loafs of bread with 1/2 a teaspoon of yeast so that’s pretty cool. 24 March 2010 at 8:28 pm. 16 March 2012 at 1:09 pm. The quantity of supply-side economists would it decide on screw in a very bulb? None, when the government would just let it rest alone, it could screw itself in….